​Anxiety disorders can occur alongside other mental or behavioral disorders as well. Following are brief descriptions of some of the most common coexisting conditions. Tic disorders—A tic is a sudden, rapid, repetitive movement or vocalization, such as repeated head jerking, facial grimacing, eye blinking, or throat clearing. Between 20% and 30% of people with OCD report having had tics at some point. A smaller number have full-fledged Tourette’s syndrome, a neurological disorder characterized by frequent, multiple tics. Substance abuse—The relationship between anxiety disorders and substance abuse is less clear-cut. Several studies have reported a significant association between the two problems. But a recent analysis suggests that, rather than a direct relationship, it might be an indirect one based on a common denominator, such as depression. There is also conflicting evidence on the link between early anxiety and later substance abuse. Researchers found that children who suffered from separation anxiety were less likely than other children to begin drinking alcohol as they grew older, and those who did drink tended to start at a later-than-average. On the other hand, children with GAD were more likely to begin drinking and did so earlier in adolescence. ​Depression—There is a very strong association between anxiety disorders and depression. Clinically speaking, depression is a mood disorder that involves either being depressed or irritable nearly all the time, or losing interest or enjoyment in almost everything. These feelings last for at least two weeks, are associated with other mental and physical symptoms, and cause significant distress or impaired functioning. Young people with anxiety disorders are eight times more likely than those without the disorders to suffer from depression. There may be a sequential link between the two conditions as well. 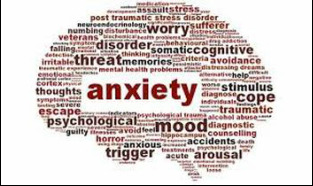 Individuals who had an anxiety disorder in childhood have an increased risk of developing depression later in life.